1: " Chiropractors dont have adequate education"
The Chiropractors at Sydney Wide Chiropractic have at least 5-6years of chiropractic university education at Macquarie University. In order to be a chiropractor one must first undertake 3 years of an undergraduate degree in science or health science and then two years of a masters in chiropractic. 2: "It only helps with spinal conditions not joint pain"
Quite the opposite, in fact, chiropractic is also used for peripheral joint pain such as for shoulders/knees/ankles/wrists/hips and feet. Manipulation therapy can done on just about every joint in the body. 3: "Sydney Wide Chiropractic treats back pain only"
Some Chiropractors may only do so, but that is like changing your motor oil only when your engine is smoking.Hence we help with headaches, neck pain, muscle tensions and postural misalignments to name a few. The spinal adjustment itself does not hurt, however you may be sore after the first adjustment, similar to starting an exercise program. 5: "Chiropractic is just a health trend"
If chiropractic is a health trend, it is the country’s longest trend since it has been around for over 105 years. 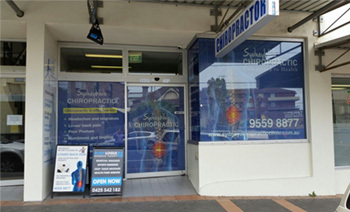 We are here to help for an appointment please call Sydney Wide Chiropractic Marrickville on (02)9559 8877 . Don't Wait for the Pain to get worse!